A business trip to New York is always a good opportunity to hear some music and meet some friends and artists. 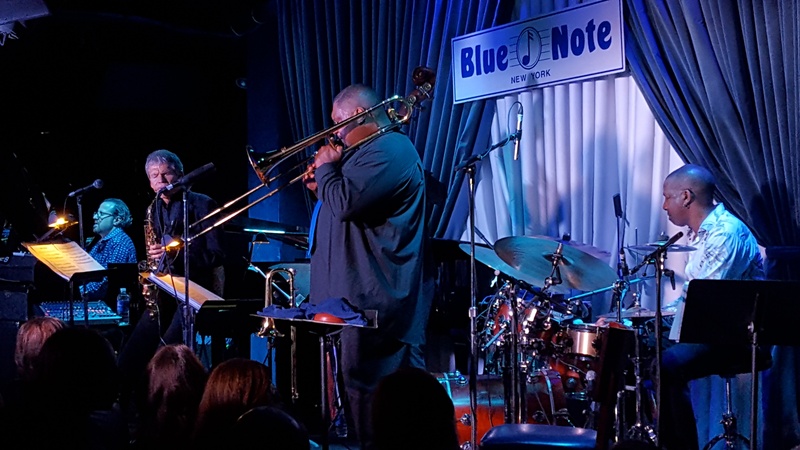 This time was no different and the first to hear was David Sanborn, who performed for one week at the Blue Note, introducing a brand new band. I never had heard of the pianist Andy Ezrin before, but throughout the show did enjoy his playing on piano and organ, of course I know Wycliffe Gordon, but had never seen him performing and loved every second of it, especially when he performed on the soprano trombone, which sounded almost like a slide trumpet. The rest of the gang beside the amazing Sanborn were Ben Williams on bass and Billy Kilson on drums and both don’t need further introduction. This was the first night this group ever played together and they were smoking from the first note – they started the set with a powerful rendition of Michael Brecker’s Tumbleweed and with that made a statement of intent – this is going to be a hard hitting and swinging modern jazz band! They continued with 2 more Brecker compositions – Half Moon Lane and Night Blooming Jasmine – both showcasing the amazing talents of this band, led by Sanborn, who was in the best possible mood and inventive and inspired in his soli, followed by Wycliffe, who pushed his sidemen to deeper musical levels. This was followed by two of Sanborn’s own compositions – Maputo and Sofia – here given a hard swinging and grooving treatment and the D’Angelo/Roy Hargrove tune Spanish Joint, featuring more impressive soli. They ended the set with Gordon’s On The Spot and smiles all around – one can only wonder how these guys will sound after a few more gigs. Incredible!! 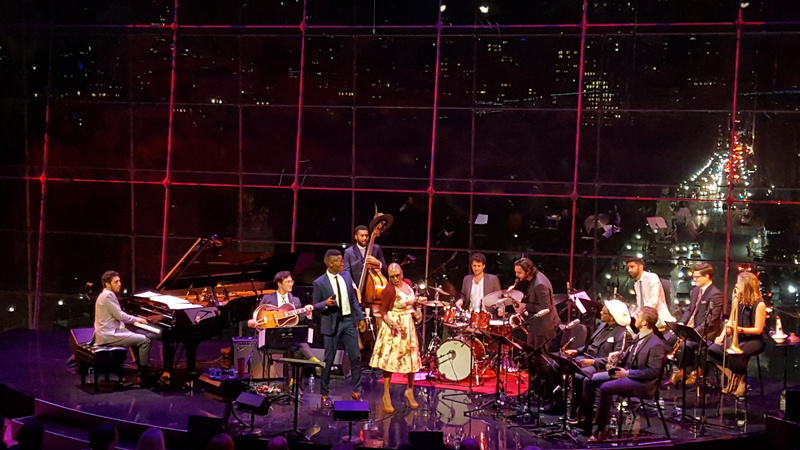 After days of meetings and dinners finally another show to attend: Dee Dee Bridgewater – Songs We Love at the Jazz at Lincoln Center. Supported by a group of 10 musicians, led by trumpeter Riley Mulherkar, Dee Dee and the band went through the American Songbook and who is better than she to do so? Starting off with St. James Infirmary, she showed why she is the best jazz singer around today: she has total control, is inventive in her soli, can be powerful and forceful and just a second later in low voice and captivating, but always pushing the song and its emotional content. She is an amazing performer, but never puts the show before the song. On the night she had two guests working with the same group of musicians – singers Vuyo Sotashe and Brianna Thomas. Young South African Vuyo I had met in October last year at the Montreux Academy and it was a pleasure to see how confident and really good he performed his own pieces and especially his duet with Dee Dee on Miss Brown To You. Brianna Thomas is a delightful singer with a great voice – obviously trained while on the road with The Legendary Count Basie Orchestra and truly beautiful in ballads. Dee Dee as always was the best, but the guests showed promise and it is good to see Dee Dee nurturing new talent that way. October 28th will see the release of the first OKeh album by singer extraordinaire Kurt Elling – The Beautiful Day. 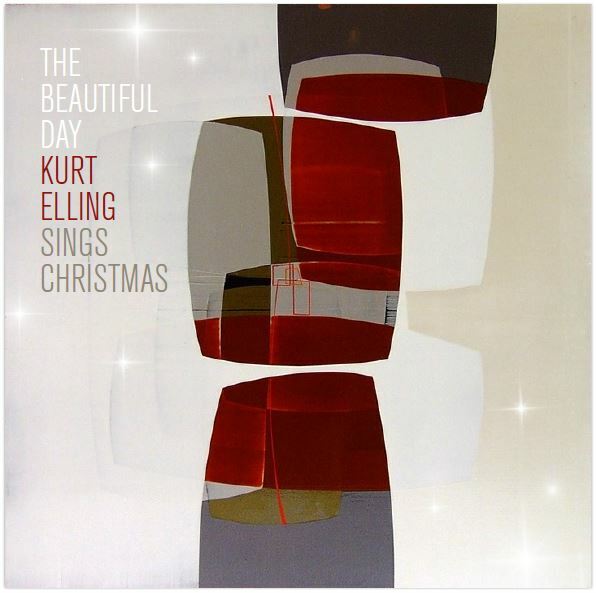 The album, a collection of swinging and beautifully arranged and performed Christmas songs, is another proof that Kurt Elling is without doubt one of, if not the, leading male jazz singer today. It is simply amazing how this album can get you swinging and in a relaxed mood, being a Christmas album without the cheesiness these records mostly tend to display. Serious music!